Hello and welcome to the Super Mario Wiki, a collaborative knowledge-base dedicated to the Mario franchise. We're glad to have you as a member. If you have any questions, just post them on the FAQ talk page or ask an experienced member, patroller, or administrator. 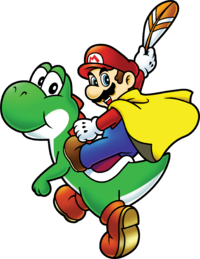 The following articles contain guidance and information about reading, authoring, and participating in the Super Mario Wiki community. If this is your first time visiting, please read our introduction. How do I become "autoconfirmed"? Feel free to delete this message when you're done reading it. We hope this information is helpful, and that you'll have a great experience contributing to our knowledge-base and our community. Remember to enjoy your experience here and to also have fun! This page was last edited on December 17, 2012, at 22:33.